Letterly Love Letterboard are handcrafted ensuring their quality. See images above. 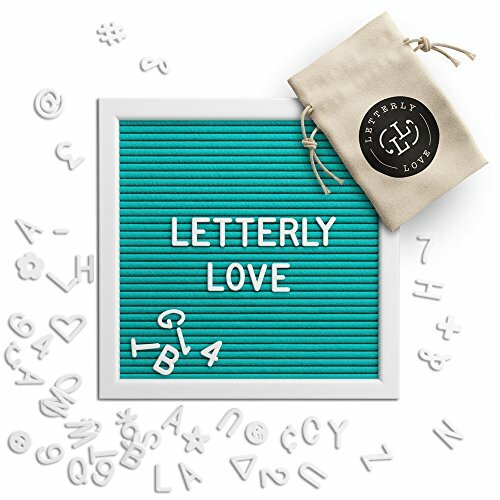 Each letter board comes with a 340 piece set of interchangeable letters, numbers, symbols and characters that are easy to use to create your own personal message. You will never run out of letters for the phrases you use. With endless amounts of customization, the letterboard can be used as an addition to your home, office, events and much more. The letterboard is ready for hanging on any wall with a mounted hook on the reverse and a table stand to sit on a surface, making it the perfect gift for yourself or for events such as birthdays, weddings, parties, photoshoots and more. 10x10 FELT LETTER BOARD - Aqua turquoise felt white lettering. The perfect size to hang on any wall. 290 3/4 INCH LETTERS INCLUDED - There are endless ways you can customize this letter board with inspirational, lyrical, motivational quotes and much more with the easy to use letters/numbers/symbols included. MOUNTED HOOK INCLUDED - A mounted hanger is installed on back of board for easy wall hanging. GREAT WAY TO DECORATE - This letter board can be hung on the wall, leaned or propped on a table, or used as a photography prop. If you have any questions about this product by Letterly Love, contact us by completing and submitting the form below. If you are looking for a specif part number, please include it with your message.